This paper presents a practical approach to project evaluation using techniques of modern financial economics, with a sample application to oil development under a complex tax system. The method overcomes shortcomings of conventional discounted cash flow (DCF) methods which are either imprecise about the relation between economic value and uncertainty, or are rigid and unrealistic in the required assumptions about how a project's risks (and therefore its value) are influenced by market conditions, the project physical structure, and tax and contract provisions. It is based on the formulation and estimation of an "information model" which represents the resolution over time of uncertainties underlying a project (oil prices in the examples shown). The project can then be valued using derivative asset valuation, which replicates the consequences of a complex asset by a traded portfolio of simpler assets (in our case, riskless bonds and future claims on oil). Should Carbon Taxes Be Additional to Other Transport Fuel Taxes? If transport fuel is taxed as a method of charging for road use and congestion, then, as a first approximation, carbon taxes should be superimposed on the existing taxes and the final price of transport fuel should rise by somewhat more than the carbon tax. If transport fuels are already taxed, the cost of meeting the emissions target will depend sensitively on whether the reduction in CO2 emissions is a proportion from base levels or to a target level, depending on factors other than fuel consumption (GNP or population). This paper presents a monthly econometric model of petroleum refining supply in the United States. The model is derived using a multiproduct restricted cost function with adjustment costs. The Euler equations are used to estimate the convenience yield from holding inventories. Short-run petroleum product prices are closely related to crude oil costs but the responses vary by product. Shipments and inventory levels are also important factors in short-run price determination. An examination of the distillate fuel oil price surge of December 1989 and the Exxon Valdez accident of March 1989 suggest that shifts in the derived demand for crude oil may be a major factor in the transmission of demand shocks to product prices. The New York Mercantile Exchange's Crude Oil futures contract is investigated for the existence and nature of risk premiums and informational efficiency. During 1983-90, there is some evidence that short-term premiums were positive and covaried with recent volatility. As for efficiency, we find nothing inconsistent with weak-form efficiency, but some apparent violations cf semi-strong efficiency. We argue that, for a number of reasons, such rejections should be interpreted with caution. 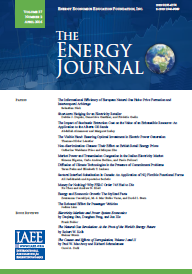 This paper re-examines the empirical evidence for random walk type behavior in energy futures prices. In doing so, tests for unit roots in the univariate time-series representation of the daily crude oil, heating oil, and unleaded gasoline series are performed using recent state-of-the-art methodology. The results show that the unit root hypothesis can be rejected if allowance is made for the possibility of a one-time break in the intercept and the slope of the trend function at an unknown point in time. This paper examines energy use and environmental deterioration in Haiti. It applies linear programming to the national energy balance to analyze whether or not the substitution of kerosene or other petroleum fuels for charcoal is economically beneficial and whether it will result in a reduction of pressure for deforestation. It concludes that because of the inefficiencies in the production of charcoal, the substitution of kerosene for charcoal is an economically beneficial option. However, if stimulated through price incentives alone, it is unlikely to lead to an overall reduction in the quantity of wood used for fuel. Energy and environmental policy, therefore, must focus on interfuel substitution, improved efficiency and rural afforestation, in addition to "getting the prices right".